So get ready to be blown away by hundreds of amazing facts and statistics about veganism! Climate change is a big thing that we hear about almost everyday. Did you know that your diet could be damaging the environment? This vegan infographic shows the main causes of global change and how a vegan diet can help tackle environmental issues. Thanks to the guys over at Culinary Schools for producing an interesting and thought provoking vegan infographic. Produced by Ethical Ocean, this vegan infographic debunks the most common myths about vegan diets. How many times have you heard someone say “vegans don’t get enough protein”? This detailed infographic tackles all these questions head on and proves the vegan diet is the best. Milk might be the foundation of many diets, but not veganism. There are millions of cows harmed every year and kept in poor conditions just to produce to milk. This vegan infographic produced by Peta does a good job of explaining how cows suffer to produce milk and the torture they go through. Similar to how cows are farmed for their milk and have to live in terrible conditions, chickens also endure the same fate. This vegan infographic produced by Peta provides several replacement for eggs in your everyday life. If you love baking and can’t cope without eggs then think again. This infographic is full of fantastic egg replacements to help you make the change to a vegan diet. Since this website is all about buying vegan only products, this list wouldn’t be complete without a vegan buying infographic! Created by Delicious Living, this infographic takes a look at household items you thought were vegan, but aren’t. Some of the things on this infographic might come as a surprise, always make sure you do your research before buying household items. 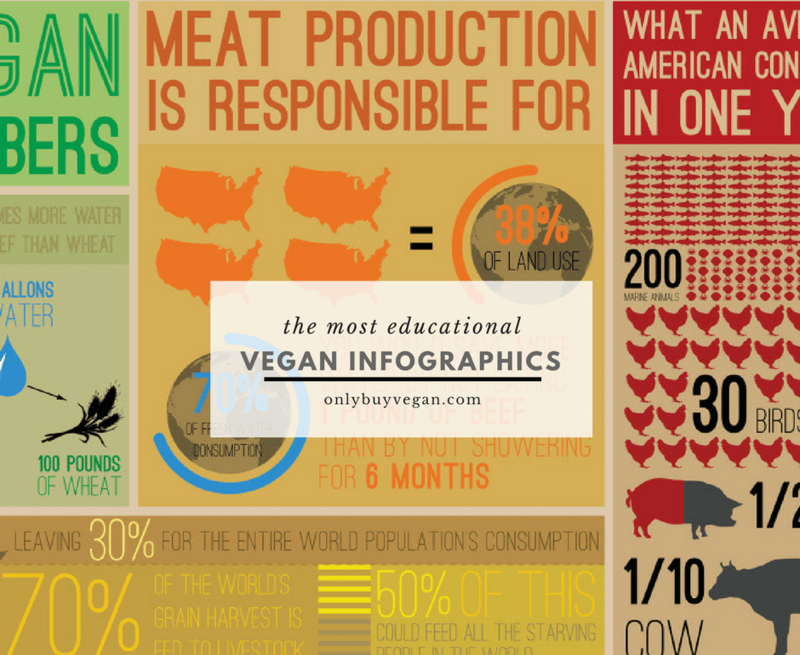 If you’re looking for facts about veganism then this infographic has got you covered. This mammoth infographic produced by Veganuary.com covers all of the main reasons for going vegan including a nice collection of data and statistics. Lovingly created by us here at OnlyBuyVegan.com, this vegan infographic takes a look at the candy world and the tricks manufacturers use to include animal ingredients in their sweets. As a vegan you probably know of the numerous super foods out there that are full of nutrients and vitamins. If you don’t then you should do, they’re essential for a healthy diet! Made by the guys over at Mercola, this vegan infographic explores the 7 super foods you NEED in your diet. No matter if you’re a vegan or not, there’s definitely something you can learn from this awesome list. Now you know even more about veganism, make sure you don’t fall victim to buying household items with animal products in them. Instead, make sure you check the ingredients and research the companies behind the products before buying. You should also look to buy vegan friendly items such as vegan shampoo & vegan toothpaste.